Mahindra Scorpio Limited Edition is launched in ‘500 limited units’, and is sporting only the ‘special Pearl White colour’. Special trims and finishes, high quality accessories and premium fabric, this Special Edition adds an element of luxury and style to the tough and rugged persona of the Scorpio, which continues to remain a favourite with Indian customers. Now in limited edition, the exterior is further enhanced with chrome plated alloy wheels and racy decals, all adding a dash of style to the Mighty Muscular image of the vehicle. The smart exterior of the new Scorpio is further complemented by its plush interiors. The high gloss wood finish centre bezel and the rich tan and beige European leather seat upholstery, heighten the style quotient. It is not just the seats that add to the executive style statement; even the steering wheel, gear shift and gear knob are encased in leather to enhance the interiors, add a touch of class and make the customer feel pampered. Further, a roof mounted 9” DVD player has been introduced to take care of the entertainment needs of passengers. A style statement and a symbol of adventure, power and driving thrill, the Scorpio has been a popular choice for adventure seekers and motorsport enthusiasts alike. It has made its mark in numerous motorsports, adventure and off-roading events in its 11 year journey. The Scorpio Special Edition is equipped with a fuel efficient 2.2 L, 4 cylinder mHawk diesel engine and its 120 bhp power allows it to zip from 0 to 60 kmph in 5.7 seconds. Additional safety features have been added in the Special Edition, which include features like ABS (Anti lock braking System) and Airbags, that keep the vehicle totally in control while braking hard on slippery surfaces. Further, the EST (Extra Stability Technology) Suspension enables greater stability and a comfortable ride too. It also boasts of a wide array of unique features including Intellipark with sensors in the rear bumper for easier reverse parking, intelligent rain and light sensors that automatically control wipers and headlights and Tyre–Tronics, a sophisticated measuring system that updates on exact air pressure and temperature on each tyre. The timeless Scorpio was said to be there in the works for a new avatar, and even proof of the same was also delivered. Now hopefully, one more spy-shot has sprouted on internet saying the confirmation about it. The latest sets of spy-shots are no different than the previous ones. Hence those covered front fascia, camouflaged dashboard, (and not badly determined) the rear can be witnessed in a tweaked form, which earlier the rear was looking as if Mahindra had forgotten to design it in the initial designing stage. However, one can also claim that alloys are also new, and they are keen on the test-run. Lest, a scoop on the bonnet to be experienced assimilating swiftly with those bullying signature front grille slats. We can expect the engineers at R&D center maybe spending a tough time in designing the new face of company’s bread and butter; a minute fallacy can take away the market from it due to the unprecedented behavior of customer regarding the “change”. 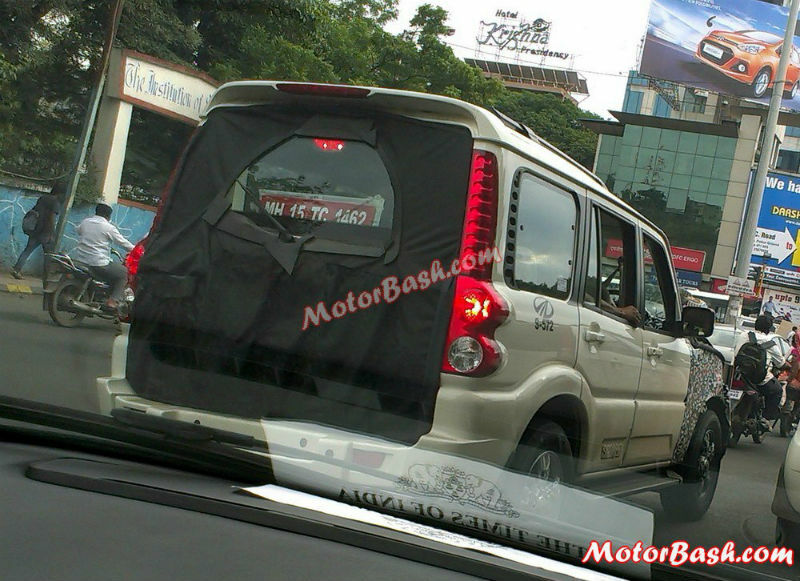 It’s been reported some days back on our portal that Mahindra teased Special Edition Scorpio for the coming festive season, now Mahindra launched the same for just ‘500’ limited units. However, we are not yet informed about its price tags yet, but there lies possibility that it maybe notched some of the grands premium than our top-end variant of Scorpio. The beige-tan leather upholstery and other interior trims, leather draped steering wheel and gear knob, chromed alloys, integrated roof-mounted DVD player with 9” screen, are some of the changes that the Special Edition will have. Safety also remains a promise for the assorted customer of Scorpio, dual front SRS airbags are embedded to do its job blissfully. 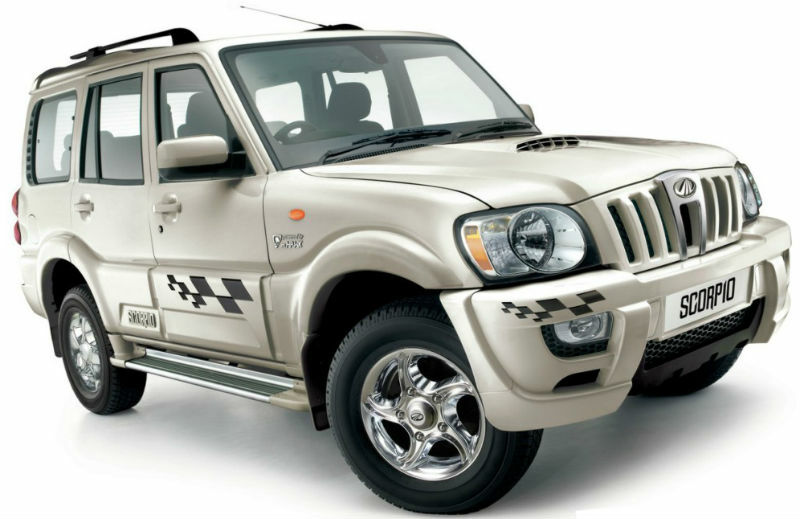 Chequered flag decals on the front bumpers and front doors with a “Special Edition” sticker at rear is made to appeal Indians in the masses. Engine is not given any of the treatment; it remains quite same with the 2.2 litre mHawk diesel producing 120bhp and 290 Nm of torque having a 5-speed manual gearbox at the bay. 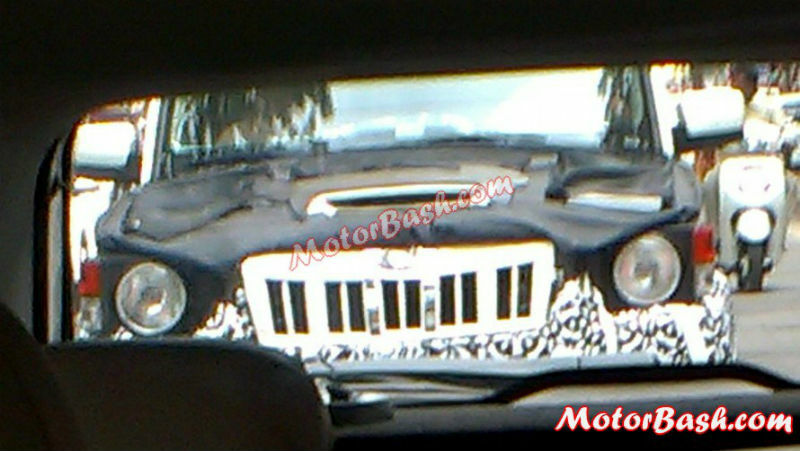 Meanwhile, the Scorpio facelift is also there under the test, which can debut sometime in the coming years. No to disappointment, Scorpio also gave the world famous SUV Renault Duster beat last month with some competitive leaps; we hope this Special Edition will keep the momentum going on swiftly further.